Life with Lynnie: We'll All Run Away?! Here in Canada, today is a holiday. 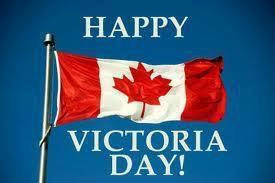 Victoria Day, to be exact. As a child, I always looked forward to this day. It seemed that we were all ready for a holiday, a time of relaxation and fun. Fireworks lit up our sky, every Monday of that weekend, whether they were large displays in the community, or simple gatherings of friends and families in their backyards. It is a national holiday, where in times past, no one worked. Of course, in today's day and age, this is not always the case. One thing most people did, was use this weekend to plant their seedlings that had grown enough to be ready for their new garden homes. Even though the actual beginning of summer season isn't until June, people generally considered it as such. Some even used this weekend to open their swimming pools, if they had them. if we don't have a holday, we'll all run away! Hopefully, some of you will recall singing this. I am sure I cannot be sole survivor of this memory! Why did we sing this? I have no idea! But, we did. And, like most children, we learned it from our parents, who probably learned it from theirs. People would consider this weekend as the first weekend of the warmest season of the year. Out came barbeques (BBQ's). And, if warm enough, bathing suits, too! I pray that whether or not you celebrate/celebrated Victoria Day, the Queen's birthday, that you will have/had a glorious day! May God bless you, friend.